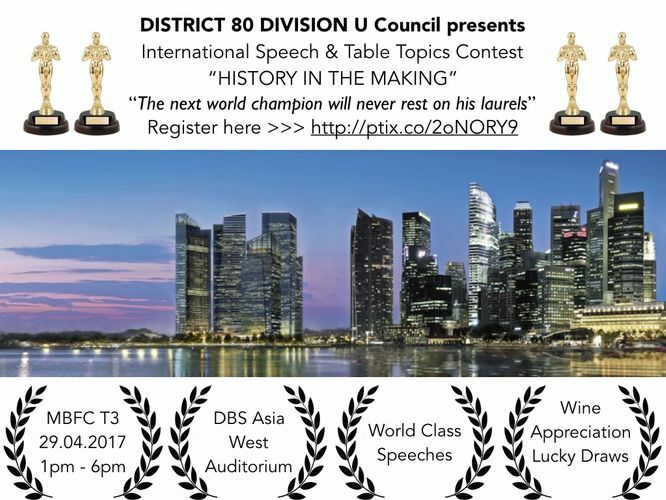 At our Division U International Speech and Table Topics (ISTT) Contest, enjoy the best of both worlds—creative tips on evaluation from internationally recognised trainer Jacky Lim, and top notch performances for prepared and impromptu speeches - at the heart of Marina Bay Financial Centre. Come support our contestants who have passed the rigorous hurdles of club and area speech contests. Hurry! Offer now extended up to 28 April 2017! Here are more details on the workshop 'Evaluation Essentials for Effective Communicators': Are you a leader who is constantly struggling to win the support of your team? A parent who feel helpless in disciplining your child? Do you desire to increase your influence over people around you, whether your at home or your workplace? Discover in this one hour workshop how you can master one of the most critical skills in influence - giving effective feedback. Learn how the psychology of influence really works and overcome resistance to excel in your evaluation. Sign up today with us at http://ptix.co/2oNORY9.